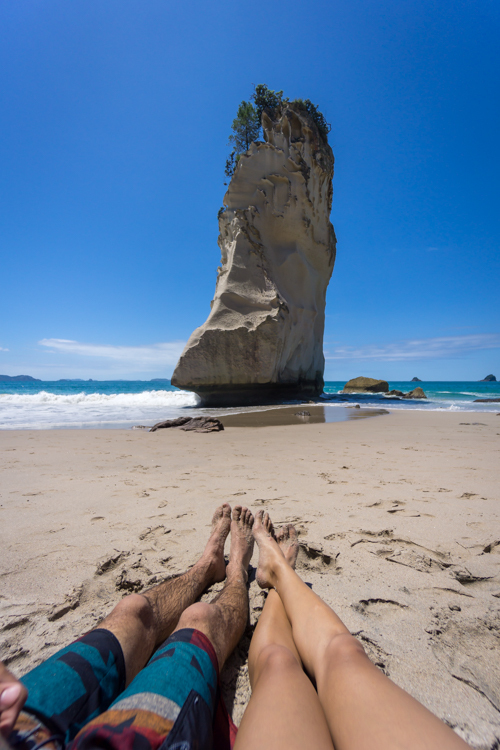 The arch at Cathedral Cove is a well-photographed spot, yet this beach is worth the detour and crowds to visit and spend a relaxing day at a gorgeous beach. The trail is well paved but still requires visitors to put in a little bit of effort to get to this spot. 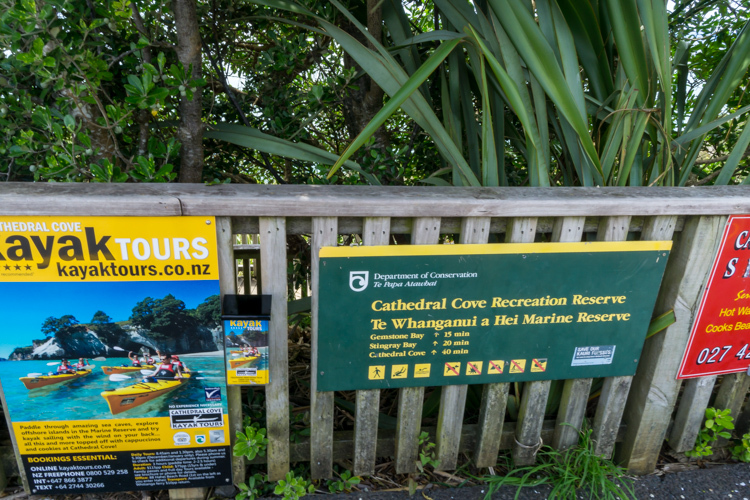 We had only one day in our 10 day New Zealand itinerary dedicated to visiting the beach, and the Coromandel Peninsula was on my must see list, so this was the perfect half day excursion! 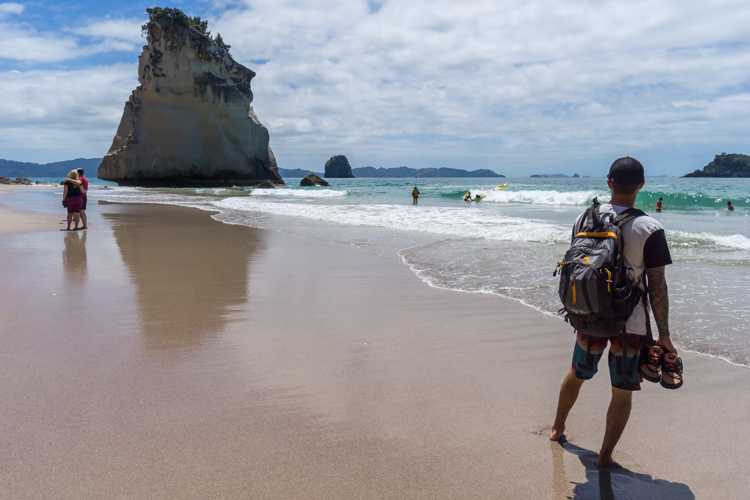 Cathedral Cove is one of 37 marine reserves in New Zealand created in 1993, meaning the marine life here is plentiful, making it a great snorkeling and diving spot. We got lucky when we visited in November and were able to find someone leaving the small parking lot and snag their spot right at the start of the trail. The carpark is quite small for how popular this area is, and you'd have to arrive quite early to ensure a spot. Otherwise you'll have to park in town and take the shuttle like most. From the lot the trail starts heading downhill on a paved walkway with expansive beautiful views of the tropical-looking ocean spotted with small rocky islands. You'll pass turnoffs for Gemstone Bay and Stingray Bay before the you reach an especially forested area, where the trail starts climbing back up. You'll also see signage for options to take the detour through the Puriri Grove (New Zealand Mahogany). The lush forest then opens back up to some rolling grassy hills, and the ocean comes back into view once again. 2,779 trees have been planted in this area of Cathedral Cove as a memorial forest to commemorate the New Zealand soldiers who were killed in the Great War - one tree for each soldier killed in the Gallipoli campaign in 1915. Soon you'll reach the wooden stairs that lead down to the sand at Mares Leg Cove and Cathedral Cove. Once your toes are in the sand, to your left you'll finally spot the famous view through the tunnel archway that has drawn all of these visitors. Once emerging on the other side, you'll be able to spot Te Ho Ho Rock, the prominent arrowhead-shaped rock just offshore. Such an enormous rock. Human for scale! The beach further down was much nicer away from the chaos happening inside the arch. We found some nice rocks for our stuff and the water was a pleasant temperature perfect for swimming compared to California waters! After spending 10 days in the mountains, it felt so nice to be back on a beach soaking up the great weather. As the afternoon rolled around, it was so hard to leave, but we still had a couple hours drive to Rotorua later that day. 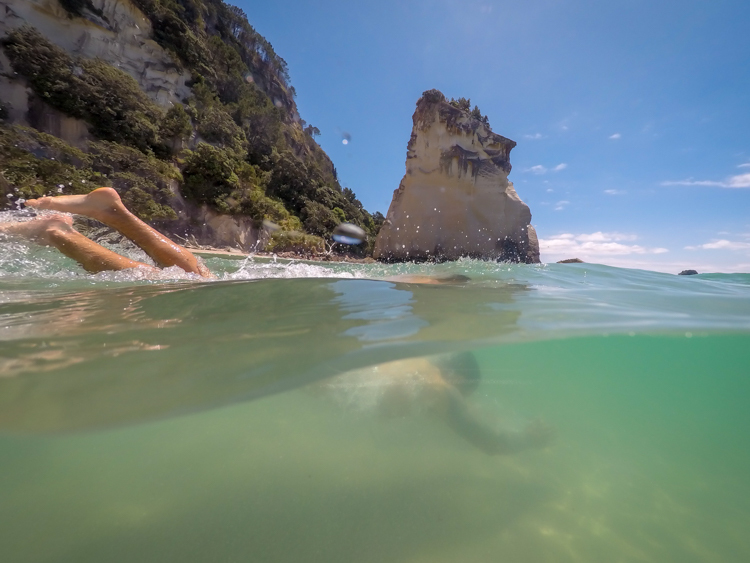 We had such a great time in the soft sand and tropical-looking waters at Cathedral Cove, I wish we had dedicated more days in our itinerary to beach days! 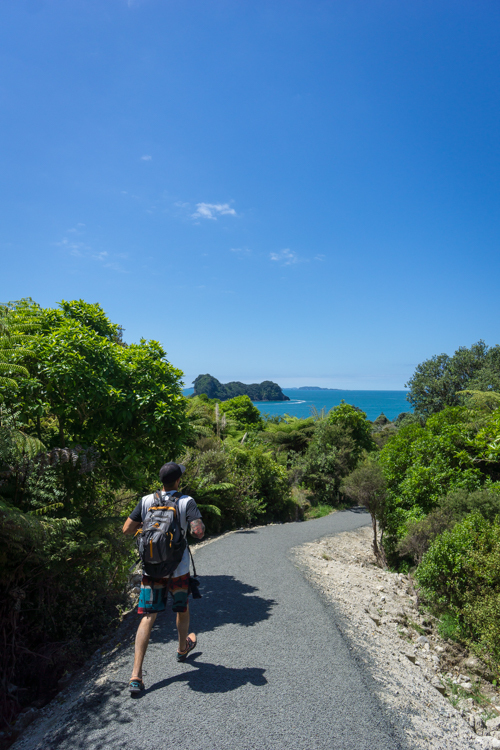 The Coromandel Peninsula has some incredible views and beaches that go to show how diverse New Zealand's scenery can be!